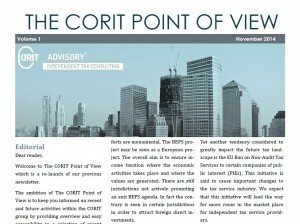 We are pleased to present the first issue of “The CORIT Point of View”. Peter Koerver Schmidt has published an article on additional protection rules’ implication for Danish CFC taxation. The article analyses whether specific anti-avoidance provisions under Danish law are applicable when assessing the conditions for Danish taxation of controlled foreign companies (CFC-taxation) and when calculating the income to be attributed to the Danish parent company. In this regard the decision made by the Danish Tax Assessment Council in SKM2014.577.SR is discussed.